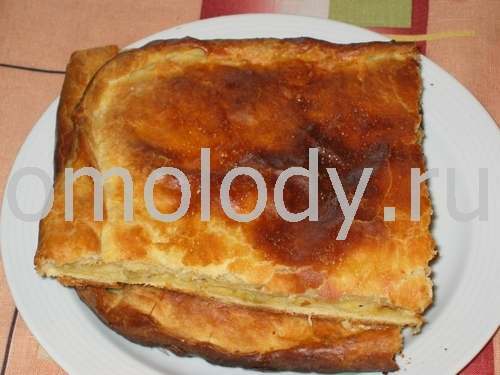 Potato Pie. Recipes from Russia. It was Catherine the Great, famous Russian Tsarina, who introduced potatoes into the Russian diet, thus qualifying this recipe. 10 boiled and mashed potatoes. 1/2 cup scallions, thinly sliced. 1 cup grated hard cheese. 1. Put the cheese through a food mill or sieve to make it smooth. 2. Beat the mashed potatoes into the cheese. 3. Beat in the sour cream, eggs, salt and chopped greens. Stir in scallions. Put in a well greased with oil mould. 4. Sprinkle the top with grated cheese. Bake in 425 F degrees until golden brown on top.